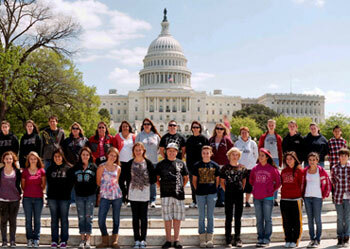 Since 1969 Imperial has offered Educational Tours for groups. In our early years we chartered hundreds of aircraft for one day tours to our Nation’s Capitol. In 1981 Imperial purchased our first luxury motorcoach. Imperial now has one of the most modern and well maintained motorcoach fleets in the state of Indiana , including our new 2009 motorcoach. Imperial has the highest obtainable safety ratings from both the U.S. Dept of Transportation and the Department of Defense, who inspect and charter our equipment for the U.S. Military. As budgets are more and more squeezed, luxury motorcoach travel is the best value for your dollar. Imperial is a rare combination of a bus company and a tour operator. There are no middlemen as we design our own packages and control both the beginning and end product. Following are some sample tours for groups. For every budget, and for every interest, Imperial has an option. Each trip can be specifically designed for your group. We do most of the work and will provide a complimentary tour for your sponsor or chaperone. Benjamin Franklin said it best: “Tell me and I forget. Teach me and I remember. Involve me and I learn”. CHICAGO DAY TRIP – WILLIS TOWER , MUSEUM of SCIENCE & INDUSTRY, NATURAL HISTORY Museum and SHEDD AQUARIUM $99.00 per person. DAYTON , OHIO – (2 days, 1 night). Wilbur WRIGHT Birthplace, WRIGHT PATTERSON Air Force Base, Neil ARMSTRONG AIR & SPACE MUSEUM . Starting at $189.00 quad, $219.00 double. FORT WAYNE DAY TRIP – FORT WAYNE ZOO AND SCIENCE CENTER , GREAT HANDS ON LEARNING EXPERIENCE, DEBRAND Chocolate Factory, Sweet ending to a fun day. Boxed lunch included. $69.00 per person. WASHINGTON , D. C. AND GETTYSBURG – (4 days, 2 nights). One of our most popular Tours . Includes professional step-on-guides at GETTYSBURG AND WASHINGTON , night illumination tour, All admission, 6 meals, accommodations at Embassy Suites. Starting at $569.00 quad, $629.00 double. ST. LOUIS , MISSOURI – (2 days, 1 night). GATEWAY ARCH and MUSEUM of WESTWARD EXPANSION. OLD COURTHOUSE and THE DRED SCOTT CASE, FREEDOM FROM SLAVERY. The Spectacular ST. LOUIS ZOO and ST. LOUIS SCIENCE CENTER . Includes admissions, 3 meals and accommodations. Starting at $299.00 quad, $339.00 double. Call for additional information 447-9321 or 800-642-6645. We have traveled with Imperial for over 14 years . Nothing but Excellent Experiences. Our Thanks to One and All. You are all Wonderful! Thanks. Our driver Ron was GREAT! We had a fantastic class trip. Rick, our driver, did a GREAT job with the kids explaining things. Thanks again.